Multipurpose style for news, marketing, education, online business, affiliate, service and product sites. 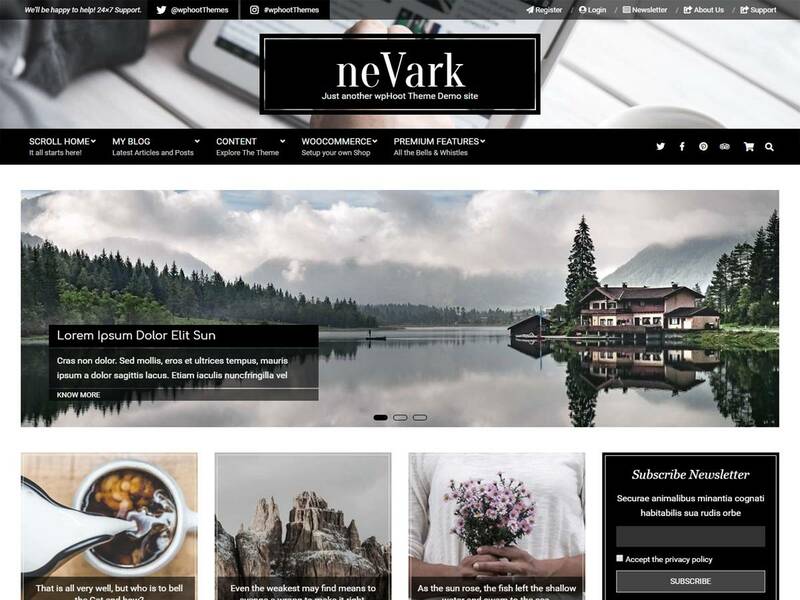 Nevark is easily customizable, fast loading, retina-ready, responsive theme with a modern bold design perfect for web agencies, studios, photography, portfolio, churches, corporate, personal and business websites. Easy to configure and customize, Nevark supports multiple widgets for flexible layout and design both on desktop and responsive mobile screens. SEO optimized and works with Yoast SEO plugin, Contect Form 7, Jetpack, Google Maps mappress, Page Builder, Elementor and various other plugins. Theme support is available at https://wphoot.com/support/ You can also check out the theme instructions at https://wphoot.com/support/nevark/ and demo at https://demo.wphoot.com/nevark/ for a closer look.